The design concept for Sky Blanket was based on the work with mountain goat wool; on the experience it gifted of time. I did my best to use the techniques I’ve learned so far from my teachers in these two styles to encompass this experience. Andy Everson and Jay Simeon contributed to the designing of this piece, which took an entire year of indecision before finalizing. The three ancestor faces on the robe represent the past, present and future: ancestors, their living descendants, and those yet to be born. The connection of the masks represents visual communication between generations, and conveys how we are connected through art. They are simultaneously also representatives of the Earth, Ocean, and Sky ancestors. In traditional Naaxiin weaving the design elements are a solid color. The thin outline of the faces I have done instead represent bones of the ancestors, or the skeleton of the art form. Our bones are a permanent record of our bodies having lived and been here, despite everything else that we are fading away. Bones are where our blood is created, and therefore I see them as strongly connected to lineage. 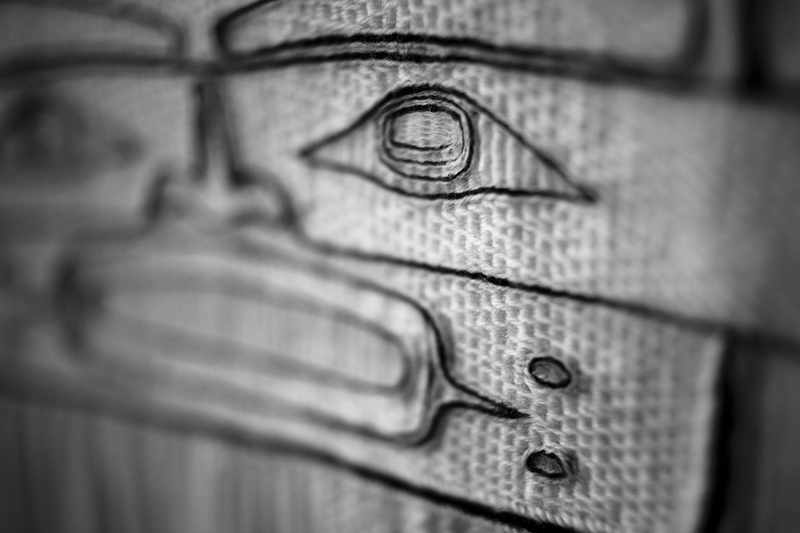 The curved vertical lines on the bottom face is derived from traditional face paint that is used in ceremony today. It is a stylized representation of the Pleiades constellation, where oral history tells we originated. In the finer details of the robe are further metaphors. I see the robes as a mirroring, or representation of the physical construct of the world around us. The warp hanging down unwoven on the loom represents the axis of time. The weft represents the horizontal axis of space. Both of these concepts are based on the theory of relativity, which states that space and time are woven and function as a fabric, which is also related to gravity. 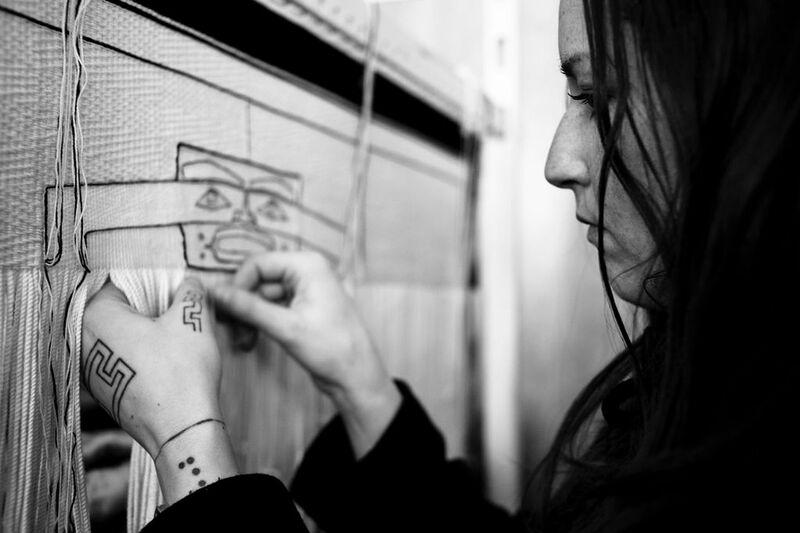 In the act of Naaxiin (Chilkat) weaving, we weave forwards and backwards through time, creating space, and the complex form lines and histories of our culture. We are making our stories real in the physical world. In this way, I am able to express a single moment and share it with the collective through this art. I hope it helps to bring about an old world that wants to live and breathe again. I wanted the robe to appear as though it was coming out of this unmanifested space, so when you look closely at the central design, you will see vertical lines woven ‘over ones’ instead of two warp ends as seen in regular stitching. The diamonds patterning throughout the faces and external robe represents worlds within worlds and infinate universes that are both inside of us and outside, or the microcosm and macrocosm. It represents the atomic level, how all creation is the same underneath and only separated by these thin lines of form. The black and white division of the robe represents opposites, the duality of this world: black and white, light and dark, male and female, yin and yang, young and old, happy and sad. The proper term for the Raven’s Tail pattern which separates these two colors is called the “lightening” pattern. In my personal metaphor this pattern represents balance between extremes, and in one way could be seen as a conceptual representation of a sisiutl. 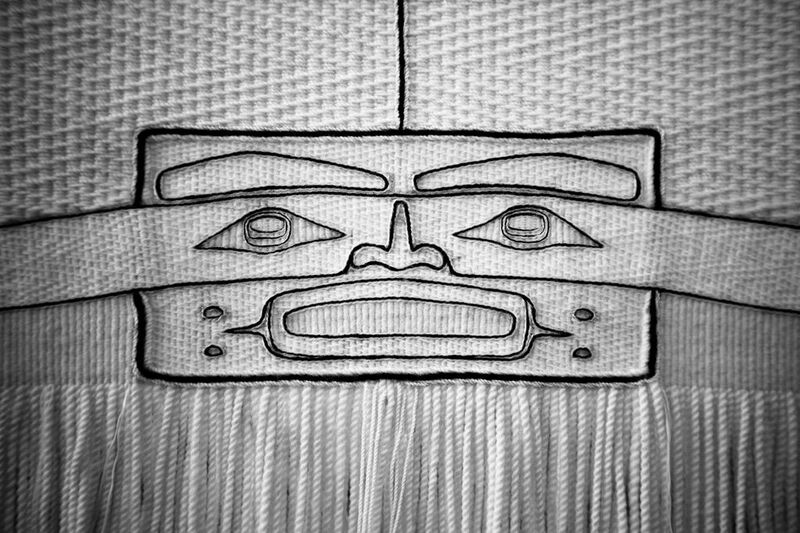 Typically a Chilkat robe will display a families crest and lineage. The experience that the work with mountain goat wool gave came from a place deeply rooted in tradition, but the experience of time dissolution is a universal human experience, reflected through many of the worlds meditative practices. Sky Blanket encompasses culture yet transcends it. It is something we can all share, as it is expressing a world view, an older concept of time which we can still connect with. Rolf Bettner photo, courtesy Haida Heritage Center at Kaay Llangaay.